کۊمٱرٱ ڤولات آفریقا منیجایی یاٛ گئل ڤولاتٱ کاٛ ها د مینجا هومپیڤٱند آفریقا ، پاتٱخت ای ڤولات شٱر بانگۊیی ٱ. ↑ UN projection "World Population Prospects The 2012 Revision: Highlights and Advance Tables". The Department of Economic and Social Affairs of the United Nations. pp. 51–55. http://esa.un.org/unpd/wpp/Excel-Data/EXCEL_FILES/1_Population/WPP2012_POP_F01_1_TOTAL_POPULATION_BOTH_SEXES.XLS. Retrieved 11 August 2013. 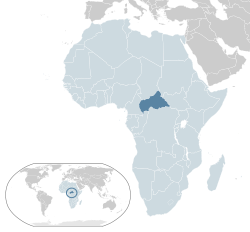 ↑ ۳٫۰ ۳٫۱ "Central African Republic". International Monetary Fund. http://www.imf.org/external/pubs/ft/weo/2015/02/weodata/weorept.aspx?sy=2015&ey=2016&scsm=1&ssd=1&sort=country&ds=.&br=1&pr1.x=62&pr1.y=9&c=614%2C668%2C638%2C674%2C616%2C676%2C748%2C678%2C618%2C684%2C624%2C688%2C622%2C728%2C626%2C692%2C628%2C694%2C632%2C714%2C636%2C716%2C634%2C722%2C662%2C718%2C642%2C724%2C643%2C199%2C644%2C733%2C646%2C734%2C648%2C738%2C652%2C742%2C656%2C746%2C654%2C754%2C664%2C698%2C666&s=NGDPD%2CNGDPPC%2CNGDPDPC%2CPPPGDP%2CPPPPC&grp=0&a=. Retrieved 1 October 2014. ↑ ۴٫۰ ۴٫۱ "Central African Republic". International Monetary Fund. http://www.imf.org/external/pubs/ft/weo/2014/01/weodata/weorept.aspx?pr.x=44&pr.y=9&sy=2014&ey=2014&scsm=1&ssd=1&sort=country&ds=.&br=1&c=626&s=NGDPD%2CNGDPDPC&grp=0&a=. Retrieved 1 October 2014. د نۊ زنٱ بیٱ د"https://lrc.wikipedia.org/w/index.php?title=کۊمٱرٱ_ڤولات_آفریقا_مینجایی&oldid=89536"
اؽ بٱلگٱ ایسنؽا آلشت بیٱ د ‏۲۷ آڤریل ۲۰۱۸، د ‏۰۵:۲۰.